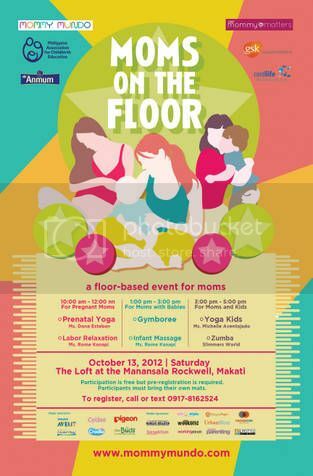 Mommies, are you ready for a day of fitness, bonding and fun? If you are, then you should join Moms on the Floor this Saturday, October 13, 2012 at The LOFT, Manansala Tower, Rockwell, Makati. Moms on the Floor is a floor-based learning and bonding activity for expectant moms and dads and moms with infants and kids. This event, which is already on its third year, is brought to us by Mommy Mundo, the country’s go-to resource for active, modern moms. Moms on the Floor 2012 is divided into three portions; the first portion is for pregnant moms, the second portion is for moms with infants, and the third portion is for moms with kids. 10:00am to 12:00nn – This portion for pregnant moms will feature prenatal yin yoga by Dona Esteban and labor and breathing exercises by Rome Kanapi. 1:00pm to 3:00pm – This is for moms with infants 0-1 year old. This portion will feature infant massage by Rome Kanapi and mom and baby exercises by Gymboree. 3:00pm to 5:00pm – This is for moms with kids ated 1 to 6 years old. This portion will feature YogaKids by Michelle Aventajado and Zumba fun by Slimmers World. Participation is FREE but PRE-REGISTRATION IS REQUIRED because there are limited slots available per portion. Interested husbands or partners also need to register to join the event. All Participants must bring their own mats and come in comfortable clothing. This entry was posted in Mommy Mundo, Moms on the Floor. Bookmark the permalink. This is another event worth attending to. It’s a quality bonding time with our kids as well.